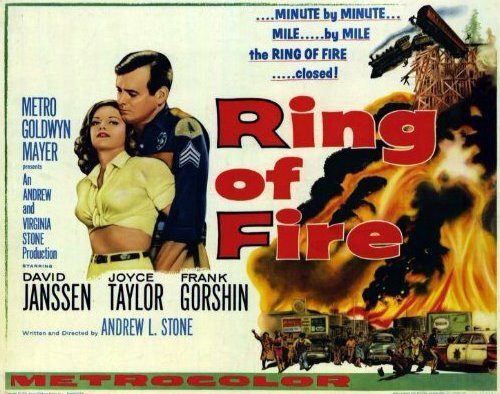 RING OF FIRE has nothing to do with the Johnny Cash classic. In this 1961 drama three punks (well, one is a punkette) kidnap a law officer. This sparks a manhunt through the woods of western Washington. It also sparks some rotten dialogue and poor acting. The locales are scenic (actually, most of it is in neighboring Oregon, around Vernonia). 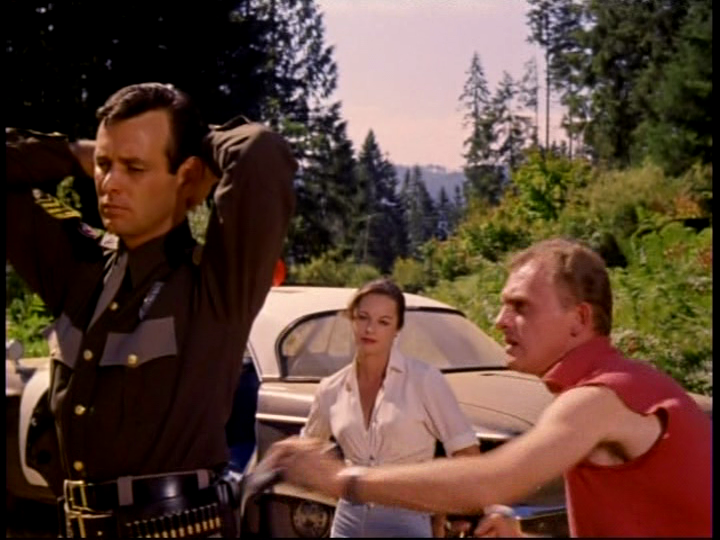 David Janssen plays a sheriff, Frank Gorshin leads the baddies. 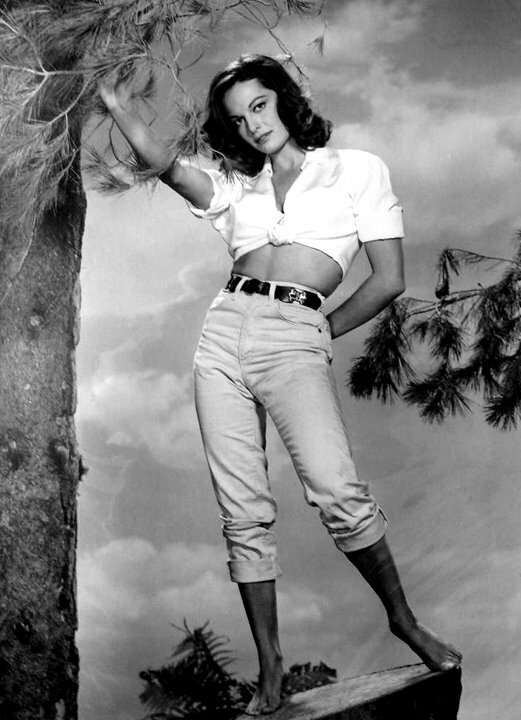 The worst performance comes from Joyce Taylor, the cutie who did so much to sink Atlantis,The Lost Continent that same year—boy, is she bad. Are her legs and feet sooty from the forest fire? That can’t be hair…. 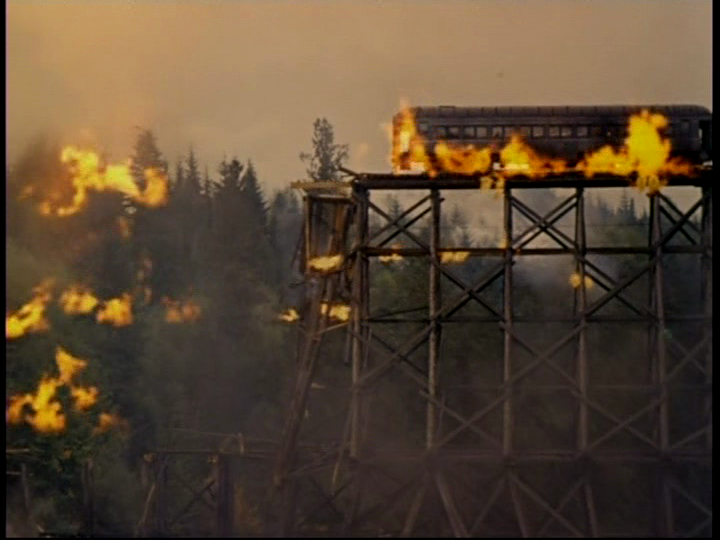 The finale of this little 91 minute yarn is a forest fire which engulfs a town, and results in a train & trestle collapsing in fiery splendor. This last should please the pyros among you and comes during the final 15 minutes, in case you don’t want to get burned by watching the entire exercise. Directed & written by Andrew L. Stone, music is by Duane Eddy, camera by William Clothier.